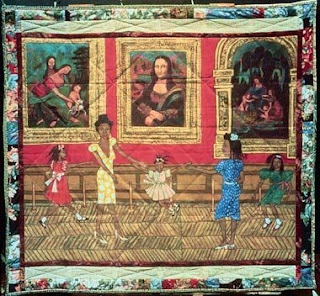 I've always liked Faith Ringgold's work. How she was a teacher that continued to explore her own creativity in the visual world. How she took material her mother worked with and eventually altered it and created her own unique visual and personal narrative. My students create quilted borders around a white square of watercolor paper by using various wallpaper pieces, then they are ready to focus on the "action" in the project. 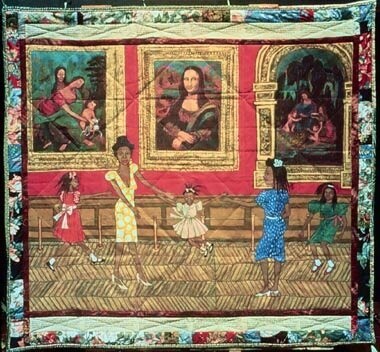 I use some of her story quilts to do a project that emphasizes movement through body position. Students practice implying motion by doing contour line drawings of poseable mannequins. This gives them a sense of how the body looks in certain positions. Observing the mannequins also emphasizes the many different body parts that are involved in a particular movement. They then try out some of their own ideas by drawing a couple more bodies and then adding clothes to one that they can move forward with on their quilt drawing. After that, they get the image down in pencil on the good paper, along with a background setting and move onto using watercolors or colored pencils to make their scene look 3d by using tints and shades of colors throughout the image. Individually, the pieces come out well, and grouped together they read as a larger quilt which can be showcased in the classroom.